With a name that suggests beauty and refinement, Perle gives your site a polished look. 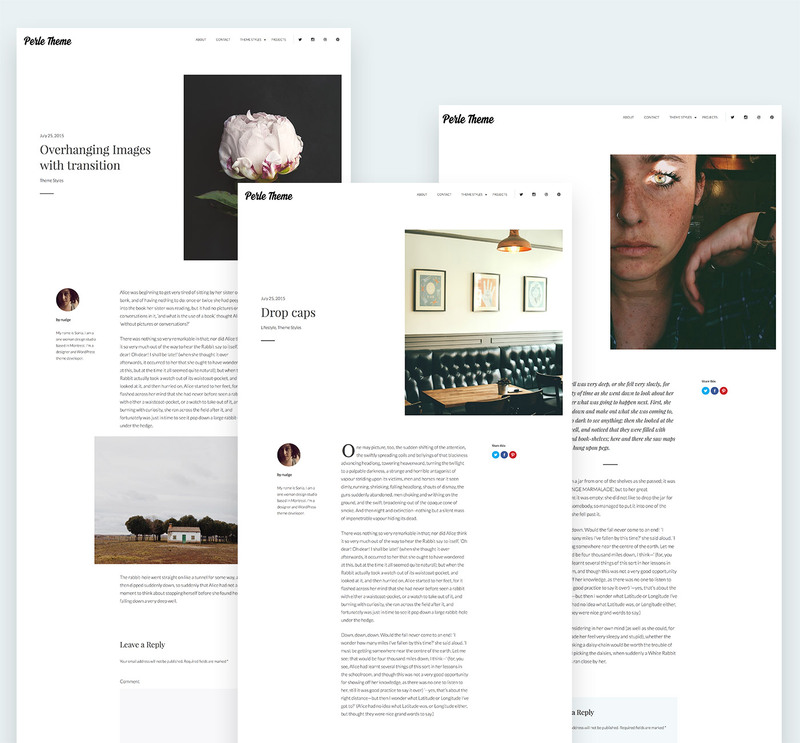 This theme is simple to set up and lets you display featured posts, portfolio projects, and your latest blog posts as the default front-page layout. Perle is the perfect theme for anyone wanting to display portrait images using a magazine design. Highlight up to four posts, pages or portfolio items with Featured Content. The subtle animation will add a touch of charm to your page. Make your site unique by adding a logo. Perle lets you easily upload yours using the Customizer. 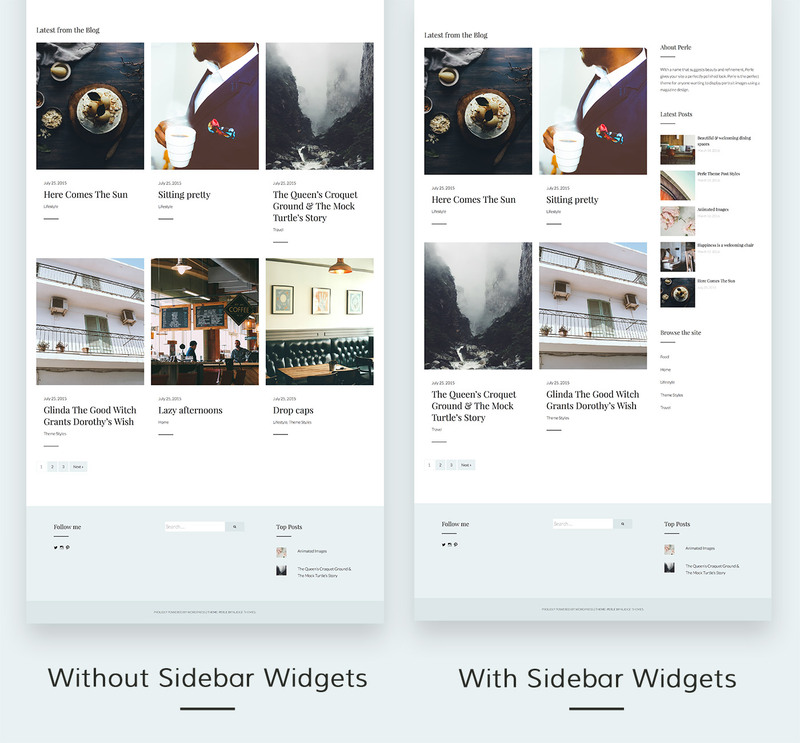 Automatically show a sidebar on your latest post and archive pages when you add a widget. If no widgets have been added, the theme will automatically display a three-column grid layout on those pages. Perle’s subtle header image animation can also be applied to any image within your post. Take a look at Perle’s documentation for how to get this working. In addition to the Featured Content area, Perle lets you showcase your three latest Portfolio items directly on the front page. You can easily show or hide these from the theme’s Customizer. You can also set a title for the Portfolio and Blog Section. Give your content extra style with overhanging images, drop caps and sub-headings. Take a look at the documentation for how to create these styles. Let your readers follow you around the web using the Social Media menu, which allows you to choose from 21 different social media icons. For more help on setting up, please take a look at the support documentation or ask a question on the support forum. The main column width is 550. The sidebar width is 408. Featured Images are 735 wide by 865 high.